"Buy this book, apply these secrets, and your prosperity will be assured." "This breakthrough book, based on the ideas of a forgotten genius, will help smart marketers increase their effectiveness a minimum of fivefold." "The principles are sound and sensible and guaranteed to help any businessperson make more money. Since 99.9 percent of businesses don't use them, anyone putting the seven lost secrets to work will gain an unbelievable edge over the competition." "One of the most revealing works ever-I literally couldn't put it down. There are life and business success lessons in each chapter." "Barton was the messiah of business who helped America pull out of the Great Depression. Now he can help all of us survive the current recession." "An excellent guide to better advertising, better promotions, and better marketing. My copywriting abilities and creative strategies have been strengthened and broadened. I'm awed and inspired." "A passionate book on the timeless, inspiring, perceptive, forceful, and sincere ideas of Bruce Barton-a man nobody really knew, a genius lost in history." "These proven principles are the foundation upon which to build a prosperous enterprise." Joe Vitale is President of Hypnotic Marketing, Inc., a marketing consulting firm. He has been called "the Buddha of the Internet" for his combination of spirituality and marketing acumen. His professional clients include the Red Cross, PBS, Children's Memorial Hermann Hospital, and many other small and large businesses. His other books include The Attractor Factor, There's a Customer Born Every Minute, Hypnotic Writing, Zero Limits, and Life's Missing Instruction Manual, all from Wiley. He is also one of the stars of the hit movie The Secret. For more information, visit www.mrfire.com. How I Discovered the Lost Secrets. The Second B In BBDO. Business Can Save The World. Why You Must Advertise No Matter What You Do. Secret #1: Reveal The Business Nobody Knows. Secret #2: Use A GOD To Lead Them. Become The Expert. Doug Johnson's Secret. How To Create A Miracle. Post & Crocker & Earhart. Secret #3: Speak in Parables. How to Sell Bad Products. A Barton Story Sells Me. Secret #4: Dare Them To Travel The Upward Path. The Zest Of The Battle. Only You Should Read This. Secret #5: The One Element Missing. You Can Fool Them Once (Maybe). Secret #6: Give Yourself Away. How Giving Led To Greatness. Secret #7: Sharpen The Knife. Act Before It's Too Late. 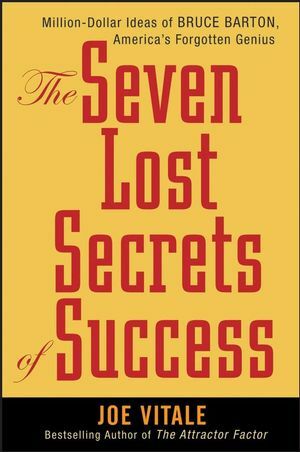 Instant Access To The 7 Lost Secrets. The First Secret: Reveal The Business Nobody Knows. The Second Secret: Use A God To Lead Them. The Third Secret: Speak In Parables. The Fourth Secret: Dare Them To Travel The Upward Path. The Fifth Secret: The One Element Missing. The Sixth Secret: Give Yourself Away. The Seventh Secret: Sharpen The Knife. The Secrets of the 2nd B in BBDO: The Copywriter That Nobody Knows. The Story of the 2nd B in the BBDO (Batten, Barton, Durstine and Osborn) Agency. The 6 Immutable Laws of Advertising. The Ads that Nobody Knows.